Juno offers a complete line of budget-friendly skin care products that will provide you the best after – treatment care plan, customized for your skin type and by season. You’re after treatment care plan is comprised of Juno’s six skin care routine essentials that will help you maintain the Juno fresh-face glow. Juno Cleansers are an essential first step of any skin care regimen. They are used to remove everyday pollutants such as dirt, oil, and makeup. Your skin will be awakened as ingredients such as ginseng, orchid and glycoproteins work to increase oxygen which is often lost with aging. Juno Toners in their simplest form are used to remove additional impurities and residue from the skin after cleansing. Containing pro-vitamins and antioxidants, toners offer hydration and balance to your skin that will help reduce your risk of clogged pores and breakouts. To survive in extremely dry climates such as the Texas Panhandle, your skin needs proper hydration to protect itself. Juno’s Specially formulated moisturizers for the morning which include sunscreens and evening use which include rejuvenation elements, help to protect skin cells and aid in rapidly repairing and reproducing new skin cells, providing you smooth, firm skin and giving you anti-aging benefits for years to come. Juno Facial Masks act as a magnet to draw toxins and impurities out of pores as well as help to encourage skin cells to shed smoothly and rapidly. Key ingredients such as bentonite clay and sea kelp work to tone and condition problematic skin. Juno Serums are used as moisture enhancements that penetrate deep into the skin working to increase elasticity, even skin tone, reduce fine lines, decrease age spots and brighten the overall appearance of your skin. The skin around the eye is thinner thus more fragile demanding additional moisture and protection and the most delicate area on the body is between the chin and lower bust line. Unique botanical complexes and amino acids in these cremes improve texture and suppleness giving your skin a younger and more refreshed appearance. 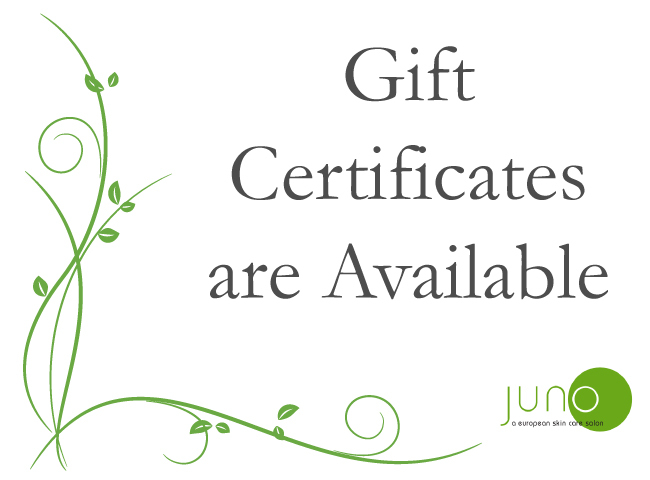 Juno’s Body Products include body washes, lotions, hand creams, and exfoliation scrubs. A mixture of botanicals and essential oils effectively refresh and condition your skin while awakening your senses for an at home, spa experience. Etja Essential Oils obtained from all natural sources formulated to be used in the steam distillation process. Their strong, pleasant odors have a stimulating effect on the body. Pure Botanical Compress Pillows are made with a blend of Certified Organic Botanicals and Non- GMO seeds. Each compress has its own unique recipe of herbs, which relieve symptoms naturally.